The past two weeks have been very busy. I was in Zanesville last week for the photo shoot and there again this week for the selection meeting. It is a 4+hour drive one way. Growing up out west influenced how I feel about drives like this. I certainly liked them better before cell phones! The photo shoot went very well. The digital version of Cast On for the Fall is is finally up. It was a tremendous amount of work for the staff. You have have to be a member of TKGA to access it, however. I haven't had much time to experiment with it but I did check the links to my patterns which all worked. I've had lots of new students since I posted last and several students have sent in lessons. Keep them coming! This week I've done a video about how to make a one-row horizontal buttonhole. This is my favorite type of buttonhole to make. It is very strong and doesn't stretch out much at all. It does requires some practice. Don't try out different types of buttonholes on the garment itself. Use your gauge swatch. You can figure out the ratio for the band and determine how many rows the band needs to be to accommodate the buttonholes. I've seen knitters rib out bands three or four times and it really beats up the edge. 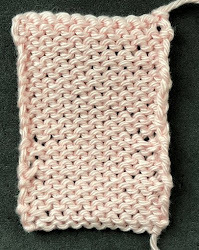 Here is the buttonhole in stockinette. There are lots of references for this buttonhole. The only thing I have to contribute is that if you do the cable cast on purlwise, the buttonhole will look better. Notice in the photograph above that the top and the bottom of the buttonhole are smooth. If you work the cable cast on knitwise, this is how it will look. I realize that this falls into the category of figuring out how many angels could fit on the head of a pin or looking so close at a leaf you don't see that you are in the middle of a forest but doesn't the buttonhole look better in the next photograph? Salon will be on Saturday this week. Hope to see you! I finished up the scarf for Martha. She wanted a small wrap for her neck. This should do it. She commissioned a scarf for Dave, her significant other. I don't do stuff like this normally but Martha did two water colors of George and Petipa so I couldn't say no. I can honestly say I have disliked this project more than anything I have ever done. She wanted a simple scarf with a "U" on it for the University of Utah. OK. The best way to do that is with intarsia which is not a reversible stitch pattern. That meant I could seam it or do in in the round. I opted for circular. Anyone who has done intarsia knows it isn't that easy to do it in the round but Master Knitter, Anne Berk has just released a book called Annetarsia which is all about intarsia in the round. First, let me say, the book gives excellent instructions on how to do this. Next, I will never do this again. If all of those little yarn balls are a pain when working flat, try it with a narrow tube. The yarn management aspect of it sent me around the bend. I first started the scarf with Cascade 220 and after about 30" I realized it would be like wearing a blanket around your neck so I switched to Classic Elite Fresco which is a lovely yarn. As you can see in the photograph I am on the home stretch!!!!! !